There are numerous people that I admire, but only 3 that I've classified since my teenaged days as "Ideals" -- human beings that I truly want to be like. One of those was born 200 years ago today. 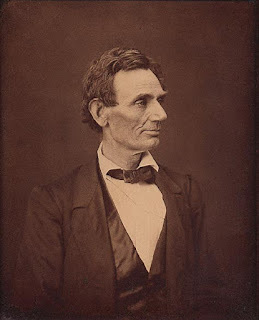 Abraham Lincoln was one of the very few Philosopher-Kings to lead the United States (I would include Thomas Jefferson and maybe Woodrow Wilson as the only others). Many of our Presidents have been men of action, often combined with a low, Machiavellian, amoral instinct commonly known as "just politics." Others were more high-minded but couldn't lead their way out of a paper bag. Lincoln could do politics and push what he needed through a fractious Congress. He could lead men, whether it be a cabinet filled with the strongest politicians of their time or a country that was in the midst of bleeding out its young boys for a cause they were not certain they believed in. But he was a man who would much rather be reading, discussing, thinking, a man who set down on paper and eloquently enunciated to his bewildered countrymen some of the sublimest sentiments every produced by a President. And he was master of it all. This is one of the things that truly amazes me about him. Here was a man who in fragmentary gulps and grabs managed to collect a total of one year's education. He spent almost all of his life in the hardscrabble frontier with farmers and merchants and politicians, many of whom, to be frank, seem to have been yahoos (not all of them of course; there was the occasional Mentor Graham or Judge David Davis). He had absolutely no executive experience, and had spent only 2 years in Washington. Yet when he went back there as President in what is still the supreme crisis of our country's history, he mastered it all -- the military, the Congress, the diplomacy, the technology. He never met his limits. His mind encompassed it all and thought deeply about why it all happened this way and what good could be wrung from this great and bloody catastrophe. Plato said in The Republic that the greatest leaders are philosophers who become a kings -- a "wisdom-lover" who can effectively put wisdom into action. To me that is what Nancy Lincoln's little boy, born 200 years ago today, became: Our greatest Philosopher-King.